Shoot full length, to show how her little body is beefing up. Maintain a consistant backdrop to show scale and keep the focus on 'lil P.
Include text, to label the month and record little memory "snippets". 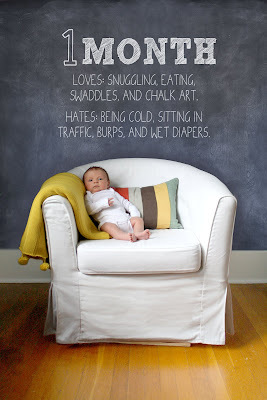 Incorporate a chalkboard- a feature element in her nursery, and a bit of a theme from my pregnancy. Thankfully Piper is (usually) a cooperative model, and she was patient with me as I fooled around. I tend to be pretty picky about this stuff, so I'm not 100% thrilled with the lighting (hard to keep that consistent from month to month) and I might play around with the text/fonts before printing them all (that part is all added in a photoshop layer). But those are things that can all be fixed (or forgiven), so overall I'm happy with what we've come up with. I don't exactly look forward to Piper growing up (my baaaaaaaby! ), but I am excited to document how she changes over time. 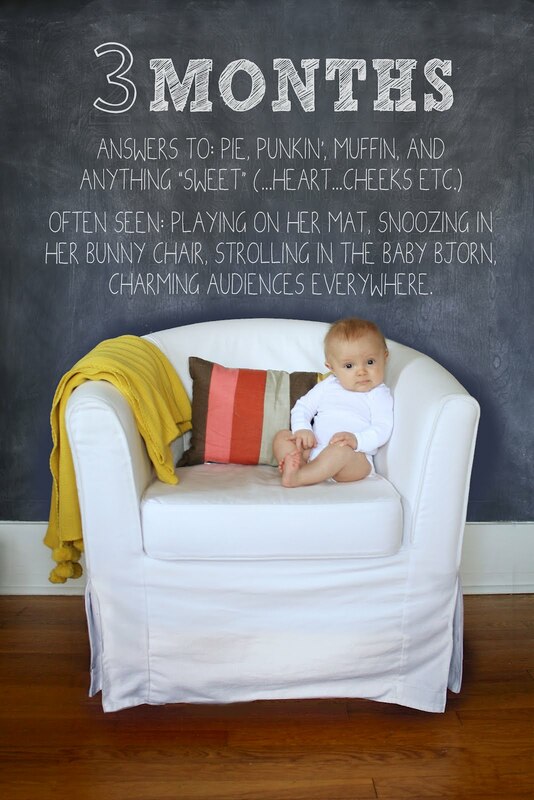 So here's our ode-in-progress to sweet Piper Jane, month by month. Dang, I love this kid. Your creativity is limitless and so is Piper's cuteness! I LOVE this idea. Really well executed too. They look so great. Also, I am officially volunteering to hold you accountable for doing this with all of your children, should there ever be more baby Bowdens, so that your other kids don't get shafted and resent you a little bit for not loving them as much.... or maybe your kids won't be as shallow as I am. 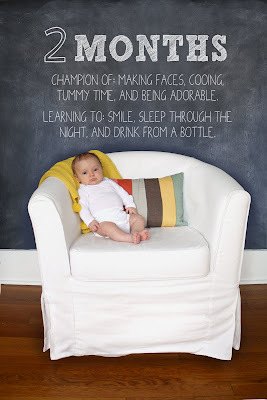 I just remembered I need to start doing something like this to document those milestones.... I remembered at 3 am so that means, I forgot by 6:30. Thanks for the reminder and that is one stinking cute little girl. 3 months already!!?!? NO!